I know. . .I know. Since I tend to post these very late at night (or early in the morning, depending on how you look at things), it's probably November 1 for most of those reading. I DID have 2 more Halloween posts I was planning on throwing down before the 31st, but due to unforeseen work circumstances (another local hotel had a gas leak and my hotel inherited all their guests, so we've had a sold out house when we're usually running about 30-40%) I haven't had the time I usually have this time of year to read and review comic books. Welcome back to Longbox Junk for another "Retro Review" edition, where I take a look at some of the older or more "valuable" single issues in my collection instead of my usual bargain bin fare. There I was. . .looking with justifiable pride at all the Halloween entries I've made this month in Longbox Junk. But then my big, cheesy grin faltered a bit when I realized something was missing from the mix. . .that being the "So bad it's kinda good B-Movie" style horror. I have to admit that I'm not very familiar at all with Star Spangled War Stories. What I DO know about it is from later issues featuring The Unknown Soldier, which is a great character. . .but really, as far as war comics go, I've always been more of a Sgt. Rock and Weird War Tales kind of guy. I found this issue at a flea market last year in pretty good condition for the measly five bucks I paid for it, and it's been sitting lonely and unread in a longbox ever since. . .the only pre-1974 issue of this title in my collection. Since "Longbox Junk" is all about reviewing comics that have probably never been reviewed before, and these "Retro Reviews" are about taking a look at some of the older comics in my collection, I decided to crack the plastic on this lonely outcast and see what's going on under the cover. First off, we have a cover by the great Joe Kubert. Unfortunately, it's not that great of a cover. His trademark sparse/primary color background make it pop nicely, and the tank is great, but other than that it just seems sort of. . .phoned in. The creature seems very generic. The purple and green coloring of it is just not good. The positioning is kind of strange. A mediocre cover by Kubert is STILL better than a good cover by a lot of artists, but this is certainly not one of his better efforts. The interior art by Ross Andru and Mike Esposito is. . .okay. It's not great, but it's not bad, either. The art tells the story in a competent way, but it doesn't have a single really good moment in the entire issue. The coloring brings the art down another notch with pink and purple dinosaurs. The art in the backup story (Dryland PT Boat) is actually better than what's up front because it takes place in a darker and more realistic setting than "Dinosaur Island", and it looks like the inker (Esposito) had more of a hand in things. Overall, the art in this issue isn't really bad. . .it just seems somewhat workmanlike and uninspired, especially considering the science fantasy elements featured in the main story. So, that was the art. Let's consider the writing. . . There's two stories in this issue, both by writer Robert Kanigher. Unfortunately (Like the art), there doesn't seem to have been much effort or inspiration put into either of them, although of the two, I found the backup story to be better than the main. Let's take a look at both. The lead is a "War That Time Forgot" story involving two members of DC's proto-Suicide Squad on a secret mission to deliver and test a new tank that can do just about everything but fly. On the way to their destination, they are attacked by a flying dinosaur and end up stranded on Dinosaur Island after a mid-air battle where they are rescued from falling to their death by a baby dinosaur they themselves had rescued during an earlier mission (in a previous issue). On the island, their tank is attacked by another creature and dragged underwater. They manage to escape, but the tank ends up on a Japanese submarine. They decide to find the submarine's lair and destroy the tank, and during their search, they come across a young caveboy fighting a giant dinosaur. They save the caveboy and he joins up with them. While tracking the submarine, they are attacked by ANOTHER dinosaur and are dropped into the water by their friendly flying dinosaur baby. While the Suicide Sqad members fight off Japanese frogmen, Caveboy plants explosives on the sub. They make their escape as the sub and tank explode, then the baby dinosaur carries them to safety. If I had to describe this story in one word, it would have to be "Juvenile". Like the art, it doesn't seem as if much effort was put into this story at all. It has interesting elements, but the execution of those elements are so simplistic and uninspired that one has to wonder if this was written as part of a bet over whether or not a comic book story can be written in 60 minutes or less. Okay, maybe I'm being a bit harsh. I completely understand that in the 1960's, comic books weren't exactly written with a 50 year old reader like myself in mind. They were being written for kids. Given that, I suppose that the writer did the job he was hired to do. Unfortunately, that was all he did. Now, I'm not going to say this story was terrible. It's not. But it's definitely not good, either. The backup story involves the son of a famous naval officer being put in command of a PT boat that is almost sunk during his very first mission. He is told that he needs to rescue some army officers on the other side of a peninsula, but there is to many mines and enemy patrols to get there by sea, so his PT boat needs to be trucked overland to the other side. On the way, the truck carrying his boat is attacked by Japanese planes and tanks, which he fights off by commanding his boat like he was on the water instead of on a trailer, eventually destroying a pursuing tank by dropping a depth charge on a bridge. Once back on the water, he is faced with an overwhelming enemy in the form of a destroyer, but hoping to live up to his father's famous deeds (He rammed a battleship with a cruiser during WWI), he goes on the attack and risks his life diving into the water to repair his last torpedo, winning both the battle and gaining the respect he had not been given living in the shadow of his father. I found this backup story to be the better of the two. The art, the subject matter, and the writing were all a notch above "The Tank Eater". That's not to say it's a great story. . .it still seems as if not a great deal of effort was put into it. . .but it holds up better to a modern reading than the Dinosaur Island shenanigans of the lead story. I thought the idea of a PT boat commander having to wage a battle from the deck of his boat while on a trailer driving across dry land was pretty clever. And like I said above, the art was a bit better with a more realistic story to illustrate. Overall, even though there were some good elements to be found, this issue was pretty mediocre. It wasn't like the artists and writer didn't have some interesting stuff to work with, it just seems like they were doing their jobs and nothing more than that. 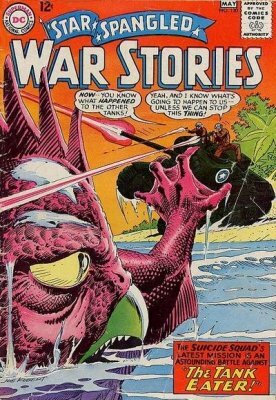 Even the great Joe Kubert's cover was uninspired and average! I know that there are pretty good issues of this title later on with Unknown Soldier, but if all I had to go on was THIS issue, I'd probably just take a pass on the whole thing. Back to Longbox Junk business as usual with a trip back to 1994 and Image's "We REALLY want to be Marvel!" Superhero overload glory days. Black & White three issue mini.